I would never wish to diminish the enormous suffering Louis Zamperini endured during World War 2 but I think Angelina Jolie's tribute to him through this film did him some disservice. If "Unbroken" leaves you a broken man after suffering two hours with it, then Jolie succeeded in her endeavor. But if you are like myself and you find yourself rolling your eyes about an hour into the movie and start feeling like you are in some bizarre theater of the absurd watching a man undergo such terrible hardship and suffering that it just couldn't be real then you will have also laughed despairingly at the movie too often at times that you would feel so embarrassed until a couple others start snickering and chuckling too. There must be a special recipe if one wants to do a biopic about a man who survived unspeakable atrocity without showing just all the suffering otherwise it defeats the primary purpose of the story, which is to inspire. The director and the top-caliber writers unfortunately did not find that recipe. Yes, many of the shots are amazing and the canvas has that "Look at me, this is an epic" feel about it but the tone adapted for the movie was just too bleak, too morose. 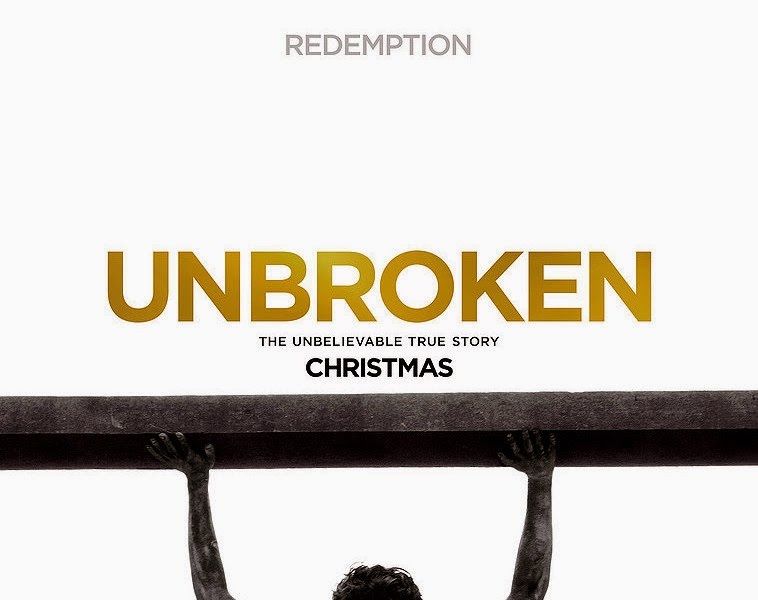 In "Unbroken", the story of Zamperini, though not completely heroic in the mold of, say, T.E. Lawrence, is something to derive inspiration from. His story is so incredible that it fits perfectly in the stranger-than-fiction category. What made his story somewhat absurd is the film's Christ-like depiction of it, including a climax that evokes Christ's carrying of the cross. Again, Zamperini's story is ultimately a triumphant one. He may have been the unluckiest man during the war but he made peace with it and in the movie's only memorable scene, just before the end credits, a reel of an 80-year-old Zamperini carrying the Olympic flame through Tokyo is shown along with the requisite end title cards telling us what became of some key characters after the war because, after all, this is a true story. The performance by Jack O'Connell is good though not as strong as his turn in "Starred Up". The Japanese actor who portrayed his nemesis was terrible - he was not entirely scary. He was weird and so was the depiction of his relationship to Zamperini.